11th December 1941. 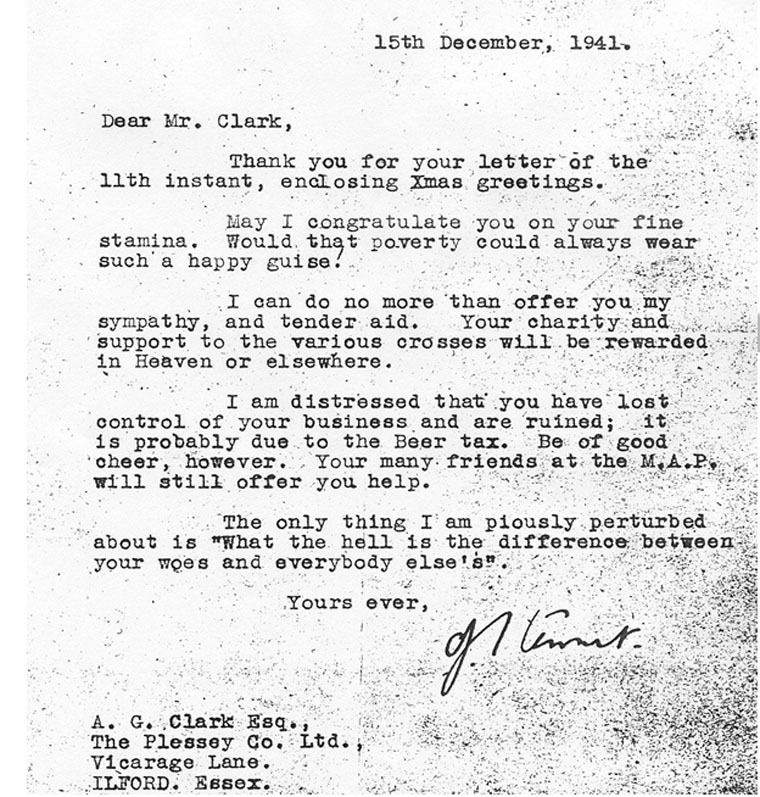 Letter Clark wrote to Mr Stewart of Ministry of Aircraft Production. 15th December 1941. 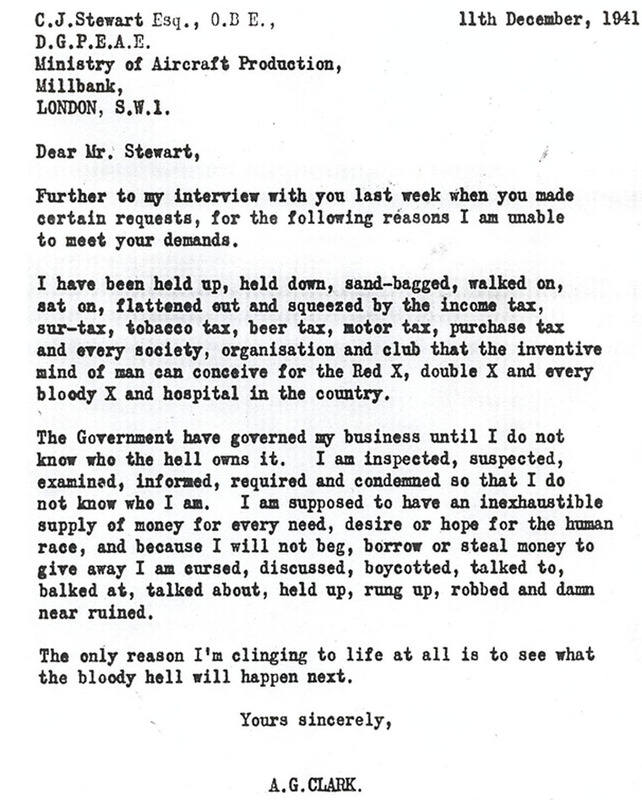 Mr Stewart's reply. Sir Allen George Clark (1898–1962) was born on 24 August 1898 in Brookline, Massachusetts the elder child and only son of Byron G. Clark, a businessman who travelled extensively in Europe on behalf of the United Shoe Machinery Corporation, and his wife, Helen Peirce. 1905 Arrived in the UK and was educated at Felsted School (1913–15) and subsequently served in the British army (with the London Scottish) until he was wounded at Cambrai in 1917. After the war he purchased, with the aid of his father, a share in the struggling engineering company, Plessey, which then had six employees at its works in Ilford, Essex. With his fellow managing director, William Oscar Heyne, he was to build Plessey into a major international company. On 25 April 1925 Clark married Jocelyne Anina Marie Louise, daughter of Percy Emerson Culverhouse, then chief architect to the Great Western Railway. They had a daughter, and two sons. The couple were subsequently divorced, but neither of them remarried. He died at his home, at Flat 1, 26 St James's Place, London, on 30 June 1962 (the last day of the company's financial year), after some months of illness from cancer. By the time of his death he had seen Plessey grow from a struggling company employing a handful of people to a multi-million pound organization with some 50,000 employees. His two sons took over the running of Plessey following their father's death. Both achieved distinction, John Allen Clark (1926–2001) being knighted in 1971 for services to exports, and Michael William Clark being appointed CBE in 1977, again for services to exports. This page was last edited on 29 November 2015, at 08:53.